A search for Images of “Cancer Cells” on Shutterstock.com has yielded 113 pages of images. to review the repository of Shutterstock.com Images and select a subset for our volume for consideration for the e-Book Cover Page. As I reviewed the +20 images selected by Dr. Larry, I realized that the process of selection involved his highest level of expertise in Cancer with a focus on Cancer Signaling Pathways and Tumor Progression. The Art of Curation of scientific findings includes various modalities of data representation. While the article on Curation Methodologies addresses curation of Text, this article will present our first Curation of Images of Biological Processes in the Voice of the Pathologist Cancer Expert. Serrated polyps-carcinoma. This pathway involves BRAF and/or KRAS in the transformation of a sessile hyperplastic lesion of the colon (without a stalk) into a malignant lesion. Consequently, the carcinoma may invade the submucosal layer of epithelium to the muscularis. The other type of lesion is the pedunculated adenomatous polyp. 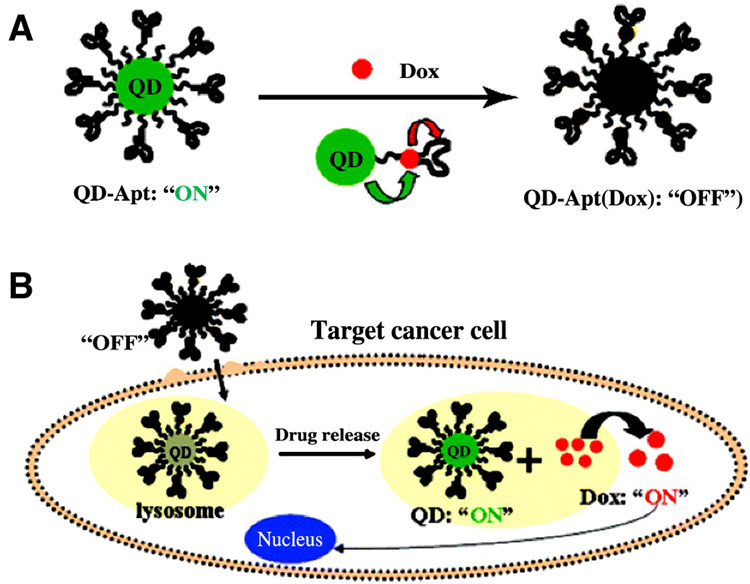 Quantum dots targeting cancer. Circulating quantum dots with targeting ligand pass through the capillary endothelium. The targeting ligand interacts with the target. QD-Aptamer – Targeted Delivery. The aptamer is attached to a QD carrier molecule. When the QD enters the malignant cell, it is released from the carrier by lysosomal action to act on the target, blocking proliferation. Progression of Cervical Cancer. The progression from normal cervical epithelium from the basal layer to the normal flat surface cells is altered in metaplasia to malignant neoplasia. The cell lose their orientation and all are hyperplastic with high nuclear to cytoplasmic ratio, proliferate, and unchecked, invade into the underlying submucosa in progression to stage 3 carcinoma. PI3K Signaling Pathway. 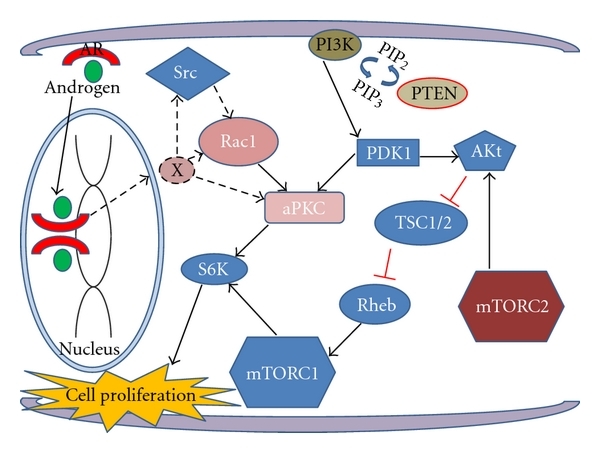 PI3K interacts with Akt and mTOR in signaling cell proliferation. There are two distinct scenarios involving G-protein coupled receptor (GPCR) and RTK for solid (α,β) and hematologic (¥,δ) malignancies. Specific inhibitors of signaling are shown. 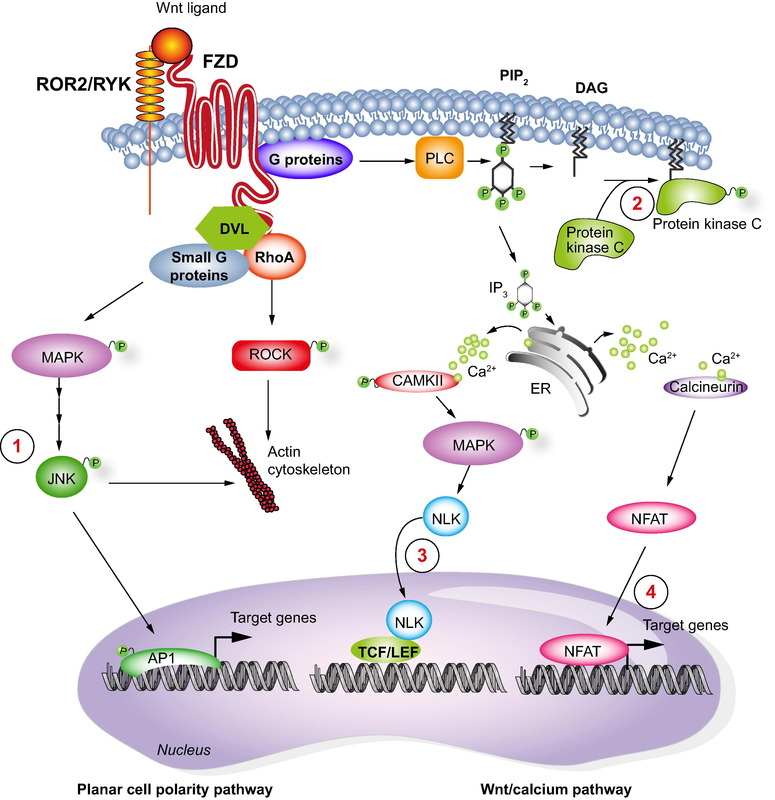 Non-canonical Wnt-FZD signaling pathway. There are canonical non-canonical Wnt signaling pathways. The noncanonical pathway is shown. Receptor tyrosine kinases of the Ryk and Ror families contain functional extracellular Wnt-binding domains and are implicated in Wnt-signaling transduction. They interact with Frizzled (FZD) receptor in the graphic to activate G-protein receptor. Then there is nuclear activation through MPK and JNK as well as NLK, and protein kinase C through Ca++. Notch, Wnt and Hedgehog. The three pathways are involved in control of proliferation. Notch interacts through NICD. 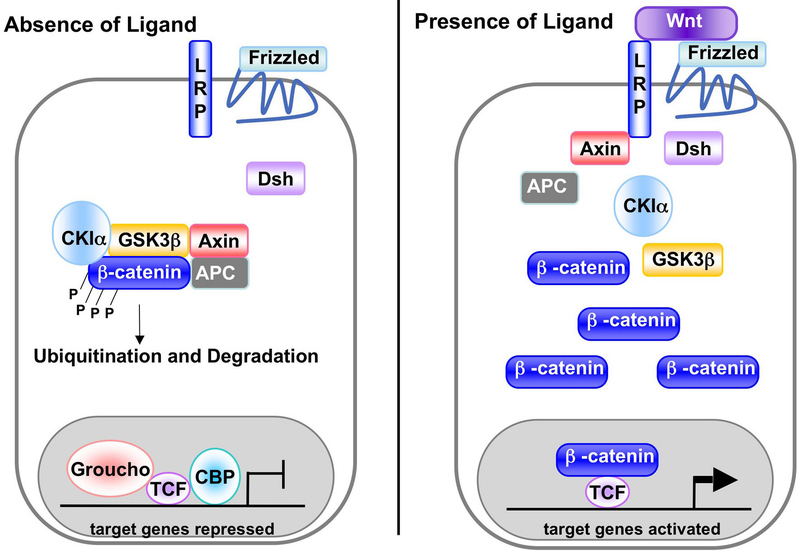 Wnt with FZD blocks β-catenin and axin, which also has an effect on hedgehog through Gli transcription factors that activate/inhibit transcription by binding to Gli responsive genes and interact with the transcription complex. The Gli transcription factors have DNA binding zinc finger domains which bind to consensus sequences on their target genes to initiate or suppress transcription. Interplay between energy metabolism, oncogenes and tumor microenvironment. As noted in Figure 9 – the tricarboxylic acid cycle with oxidative phosphorylation and the electron transport chain is central to respiration and can effect gene expression through activation of oncogenes and tumor suppressors. In this adaptive domain, depending on environmental factors, the ratio of glycolysis to respiration is determined. The Warburg effect is a shift toward glycolysis in respiratory dependent cells with a trend toward proliferation and impaired cell apoptosis. This occurs in stages involving p53, cMyc, HIFα, and phosphoglycerate kinase 1α (PGK1α). 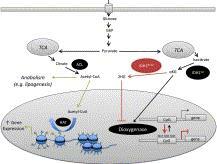 Interaction model in the regulation of stem cell self-renewal. 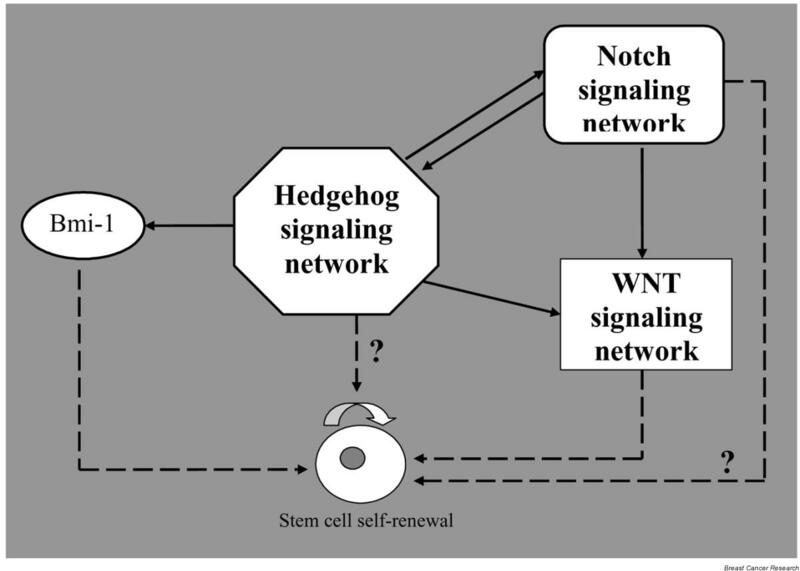 At the center of stem cell self-renewal are the Wnt, Notch, and Hedgehog signaling pathways. Impact of different oncogenes on tumor progression and energy metabolism remodeling. 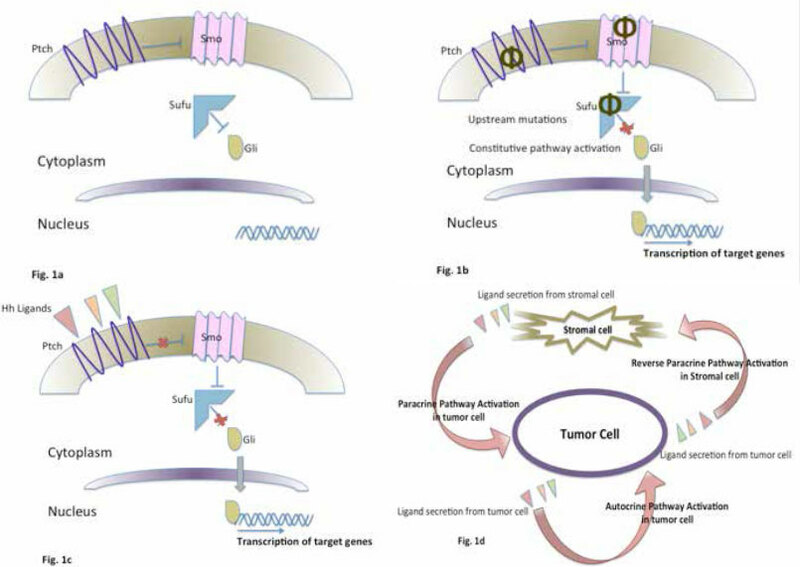 The figure expresses the interactions in Figure 10 that lead to tumor progression are driven by oncogenes. Hedgehog signal-diagram. 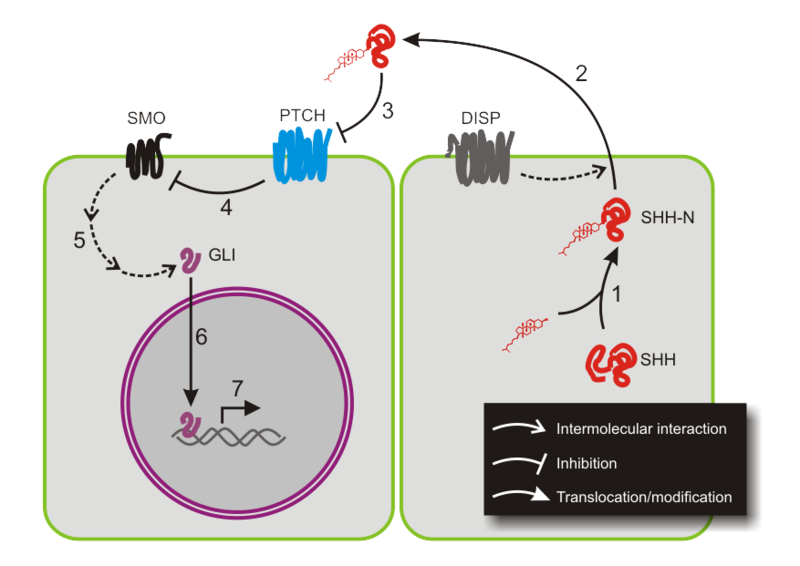 The hedgehog signal interacts with Gli protein to signal transcription activation that drives proliferation. Autocrine and paracrine mechanisms act on both the tumor cell and the stromal cell. 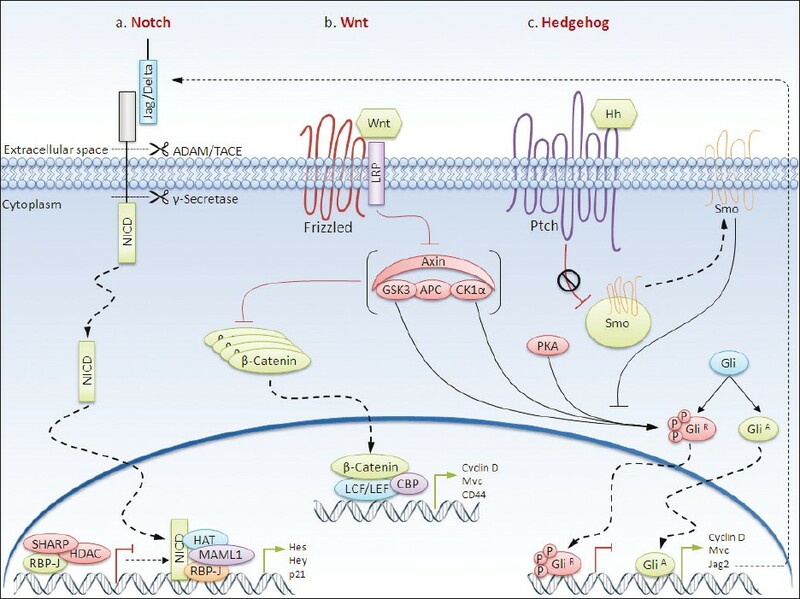 Hedgehog signaling pathway. The two diagrams are the on-off states of Hh. 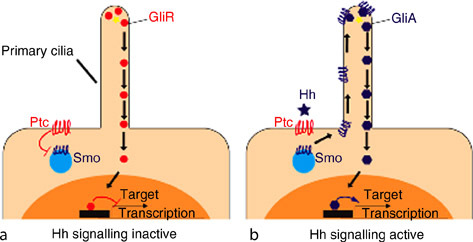 Through Gli protein the Hh signals that on state and target transcription. 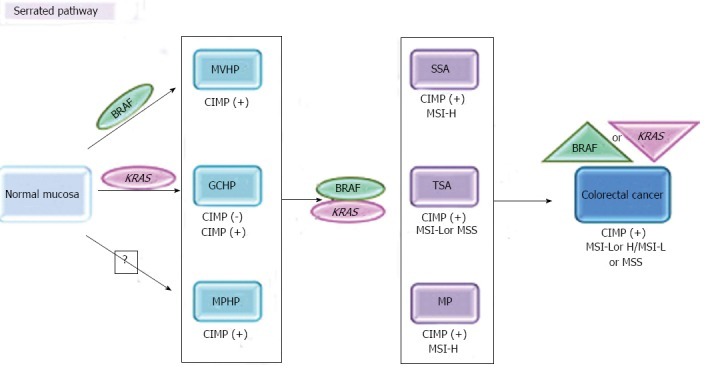 EGFR Signaling Pathway. 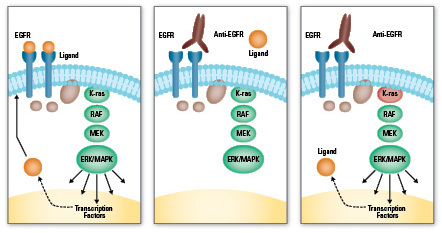 The epithelial growth factor receptor (EGFR) is a target which is blocked by anti-RGFR in the three sequence diagram. This knocks out the response elements K-ras, RAF, MEK, and ERK/MAPK from transcription activation. 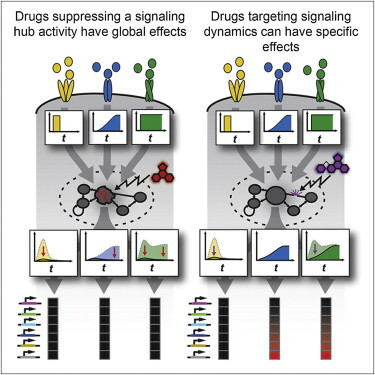 Drug targeting signaling hubs blocks features of the signal. Drugs targeting a signaling response element can have both global and specific effects on proliferation and metabolism. Development of ovarian serous carcinoma. The development of ovarian carcinoma takes either of two pathways. They involve gradual cervical intraepithelial neoplasia (CIN), frequent BRAF/KRAS mutations, and high proliferation (55% 5 year survival) and frequent CIN with p53 mutations and HLA-G expression (30% 5 year survival). 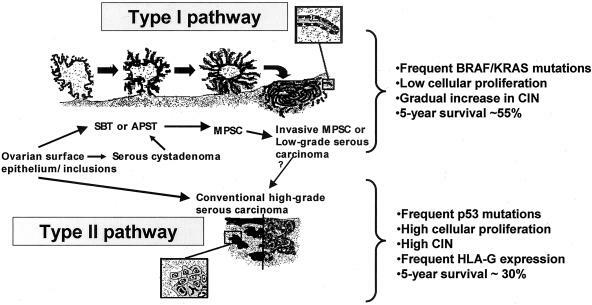 Carcinogenesis. A global map of carcinogenesis. We see several factors at the cell membrane that involve apoptosis, growth factor signaling, TNFα, Wnt signaling, and drug efflux. Within the cytoplasm we see the involvement of caspases, RAS, ERK, PI3K, Akt, and FZD to β-catenin. The effect is cell cycle arrest, inflammation, proliferation, invasion, and metastasis. Lrp5/6. Frizzled and LRP5/6 are Wnt receptors that upon activation lead to stabilization of cytoplasmic β-catenin. The extracellular domain of LRP5 contains 6 potential N-linked glycosylation sites. LRP5 is a transmembrane low-density lipoprotein receptor that binds and internalizes ligands in the process of receptor-mediated endocytosis. This protein also acts as a co-receptor with Frizzled protein family members for transducing signals by Wnt proteins. LRP5 has been shown to interact with AXIN1. 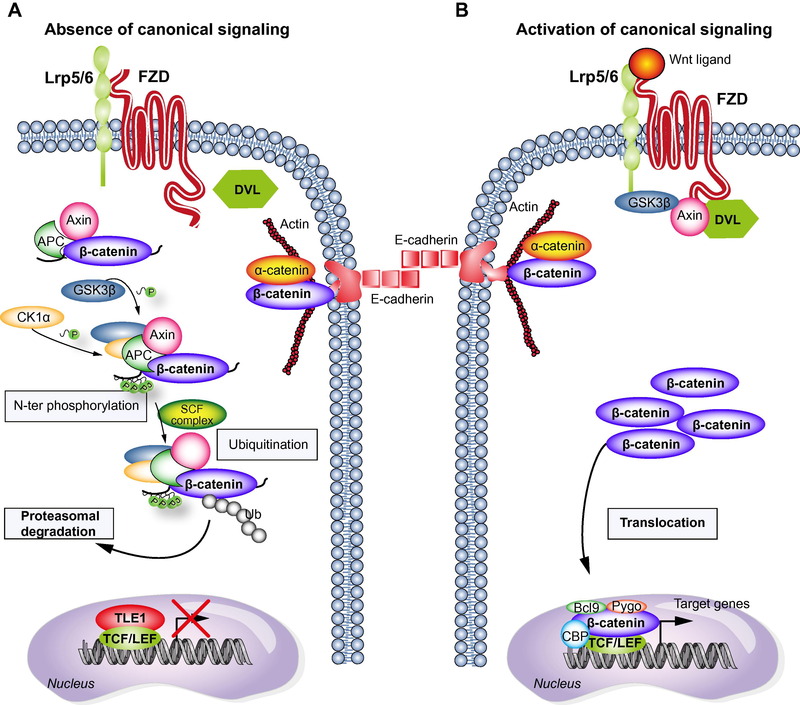 Canonical WNT signals are transduced through Frizzled receptor and LRP5/LRP6 coreceptor to downregulate GSK3β (GSK3β) activity not depending on Ser-9 phosphorylation. Canonical Wnt signaling pathway. The figure has two graphics that show either target signaling or not based on the interaction of Wnt with FZD through β-catenin. Cancer-signal-transduction. 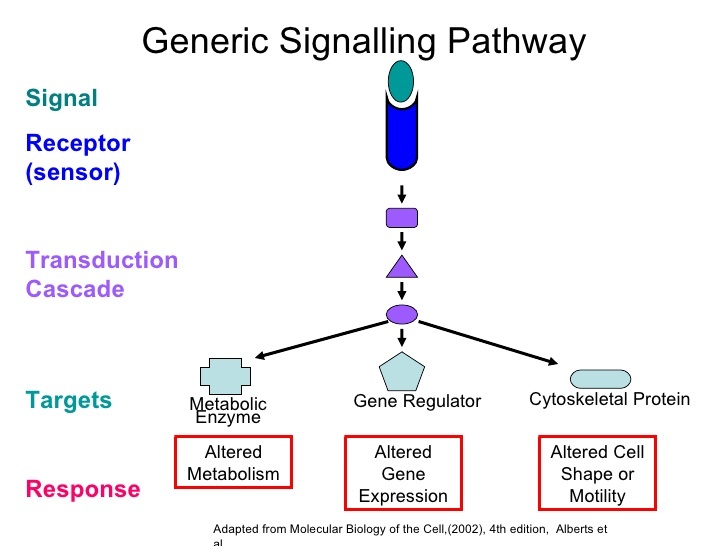 This graphic shows three modes by which cancer signaling occurs. They are by the action of metabolic pathways, by altered gene expression, and by altered cell shape or motility. The first results in altered metabolism, as in the Warburg effect, and as in altered glutaminolysis; by transcription; and by cytoskeletal changes. Androgen signaling. The previous graphics showed signaling pathways an metabolic changes, including autocrine and paracrine effects. In addition, there are endocrine driven cancers, such as, breast and prostate. In this case the endocrine dependence is not expressed in the postmenopausal woman (ER-). There is also a similar effect with respect to androgen dependent prostate cancer. The series of illustrations is a brush stroke delineating the changes that occur in malignant neoplasia. These are grossly seen as altered cell progression, loss of stemness, proximal and distant invasion. There are two broad types of cancer – carcinoma and sarcoma. Carcinoma involves the differentiation of epithelial cells that are surface lining. Sarcomas involve proliferation of muscle and interstitial fibrous tissue. Nor all of the signaling pathways are shown, but the neoplastic changes occur consonant with metabolic, oncogenic, and structural changes. There is a shift in the metabolism and substrate utilization in all types with respect to the ratio of NADH/NAD, NADPH/NADP, ATP/ADP, and glutamine. Moreover, there are links between signaling pathways within the major activitor/suppressors illustrated, such as EGFR, Akt, c-Mic, Mek, Erk, PDK, mTORC, PI3K, Axin and beta-catenin. 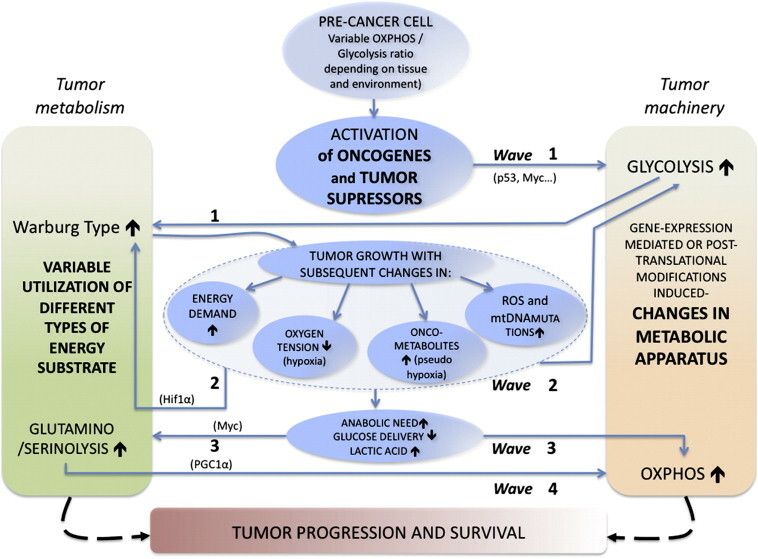 The metabolic and oncogenic patterns between and within types of cancer are drivers of progression, invasion, and metastasis, and combined they are Motifs. This delineates the neoplastic malignancies with respect to distance from cell of origin, identity, grade, and stage at time of discovery. These motifs are important for the definition of new treatments utilizing pathway specific targets. Because the oncogenic effects are both global and specific, there is risk of resistance and of potential toxicity to noncancer cells. 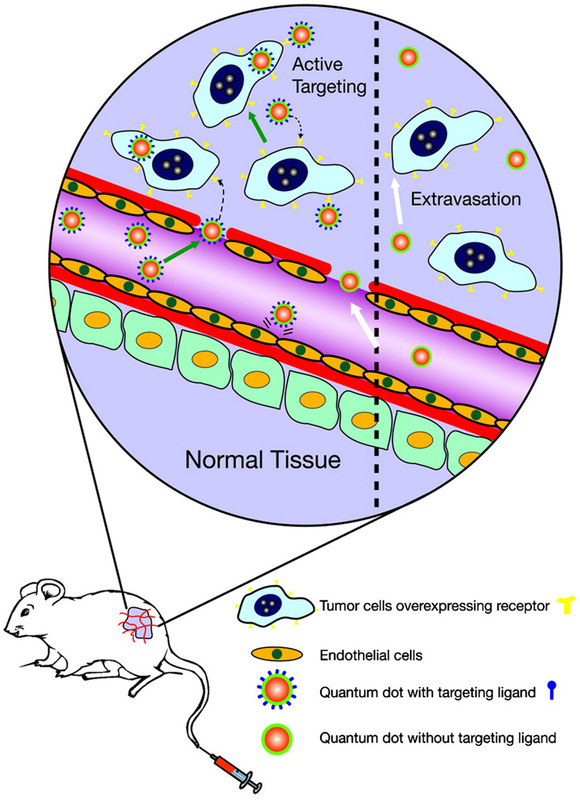 The risk will be significantly and subtly reduced using nanocarriers for delivery to the target cells. This cancer volume goes into depth reviewing the pertinent signaling pathways and concurrent metabolic changes.